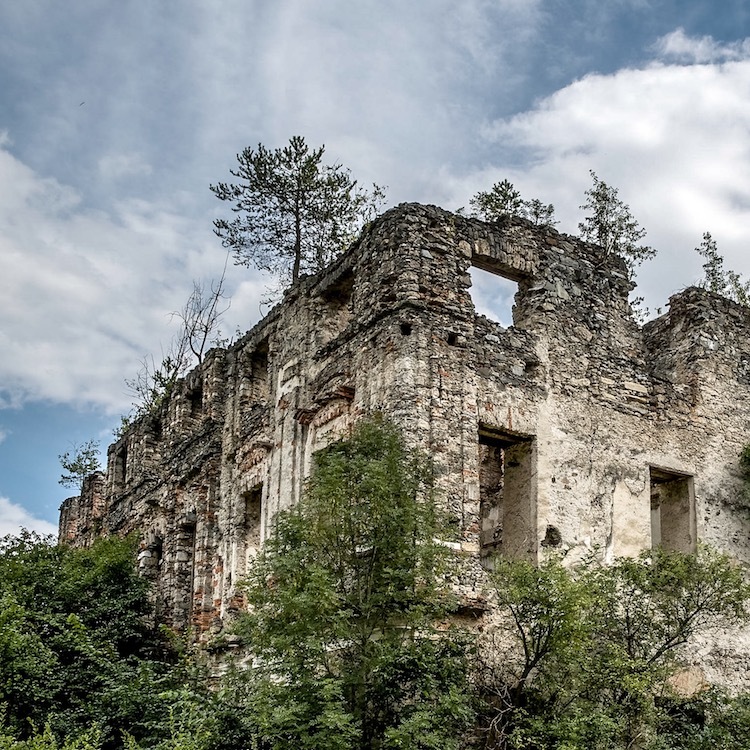 I accidentally discovered this ruin in Carinthia back in 2011. I left the highway and took a minor road to the destination to get to see more of the countryside. The road led through a few villages and over a few smaller hills. On one of those hill, right behind a curve I saw this impressive ruin right near the street. There was not much space there but I could find a small spot to park the car and began to explore the ruin. When I originally took this photo back in 2011 using a DSLR, I was into creating HDRs. I just had purchased a license for Photomatix and used the Aperture Plugin to create the original HDR. My thoughts today about that HDR I created back then: awful! So in 2018 I re-edited the middle RAW exposure of the bracketed shots using Lightroom Mobile on iPad Pro. The first photo gives a quite good impression about the size of this thing. Closeup of castle ruin Höhenbergen in Carinthia. Back at the hotel, I did some research and discovered that the ruin I had found was named Höhenbergen and was owned by the noble families Perger von Höhenperg and Windischgraetz. Allegedly a renovation was planned in the 19th century but it never began. If you’re planning to shoot a film, you can apperently rent this place. Update: It was this accidental discovery of this impressive thing that sparked my interest in lost places. Because of this discovery I traveled to Germany, Romania, Finnland and other countries to explore and photograph lost places in Europe. Check out my blog posts about all the lost places I’ve visited to far.